“Your young men shall see visions…” (Acts 2:17). “But he (Stephen), being full of the Holy Spirit, gazed into heaven and saw the glory of God, and Jesus standing at the right hand of God, and said, ‘Look! I see the heavens opened and the Son of Man standing at the right hand of God!’ Then they cried out with a loud voice, stopped their ears, and ran at him with one accord; and they cast him out of the city and stoned him. And the witnesses laid down their clothes at the feet of a young man named Saul” (Acts 7:55-58). Stephen was a young man of good reputation, full of the Holy Spirit, faith, and wisdom. Most of us would be thrilled to be noted for just one or two of these godly qualities. As we will soon discover, Stephen possessed not only these, but would be given more. Stephen was a holy vessel of a wholly new order effecting disorder among the self-righteous crowd. He was fit for the Master’s use but unfit for the religious system of his day. God raised him up in a blaze of great persecution. 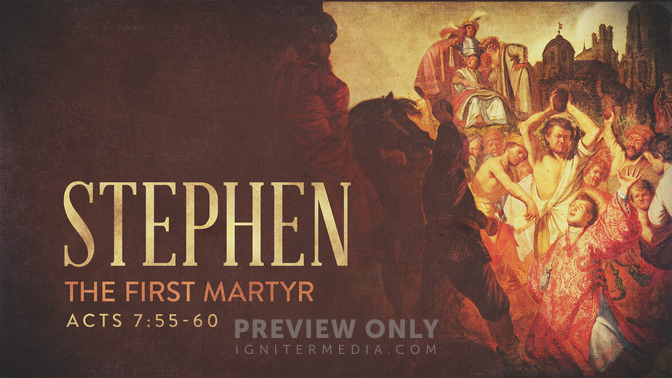 Stephen answered the call and sealed his fiery message with his own blood. Will there be end time persecution in America as great as that which was in Jerusalem long ago? And will there again be Stephens among us who have grandeur visions of heaven and of the glory of God? And will some be killed for telling the truth? We have reason to believe that Stephen’s forgiveness of his accusers and murderers was instrumental in bringing forth new birth in another young man named Saul. As Stephen’s life and earthly destiny ended with visions of heaven, Saul’s new life would soon begin with the same. And as Stephen suffered this great persecution so Saul would suffer much more. Saul became Paul because Stephen cried out for his forgiveness. The witnesses at his death laid down their clothes at Saul’s feet, but it was Stephen’s loud praying that would later lay down new paths for those same feet. Stephen’s violent departure led to Saul’s violent entry into the kingdom of God. Will this kind of violence be more frequent and mark these last days? Where are the voices of the spiritually violent witnesses, prayer-s, and preachers that are producing violent conversions? 1. His message was irresistible (Acts 6:10). 2. His miracles were great (Acts 6:8). 3. His martyrdom was violent (Acts 7:59-60). Can there be any greater heaven demanding and hell busting qualities than these? They convey both alarm and assault to Satan and his demons. They cause quaking and trembling in his darkest regions, and glory and rejoicing in highest of heavens. Ministry gifts must be unwrapped through prayer. Birth must be given to a new breed of preachers on the earth in this final hour. I believe that the coming apostolic ministries of our day will be carriers of true revival. Like Stephen of old (Acts 6:8-10) they will be full of faith and power and do great wonders and signs among the people, while speaking with an irresistible wisdom and Spirit. They will not count their lives dear to themselves but instead will be utterly abandoned to God’s eternal purposes. The combination of the deeply convicting repentance preaching of one like Charles Finney and the daring, miracle-working faith of Smith Wigglesworth will bring a mighty apostolic anointing and authority that has been lacking in recent times. It will ignite the common man to carry that witness into the marketplace. (This is an excerpt from my book, Passing On The Move Of God To The Next Generation). Our books are forerunners to personal holiness, the move of God, and the return of the Lord. They also combat the departure from the faith and the turning away from the truth we are seeing in our day. The Real Gospel, The Real Jesus, The Real Salvation, and The Real Spirit Of Revival are especially strategic in trumping the many falsehoods spreading in the modern day Church. If any of our books or articles on this blog are a blessing and encouragement to you please use the social media buttons below to share them, and kindly post reviews on Amazon for any of our books you feel are worthy. Thank you for helping unknown writers who self publish the word of the Lord.